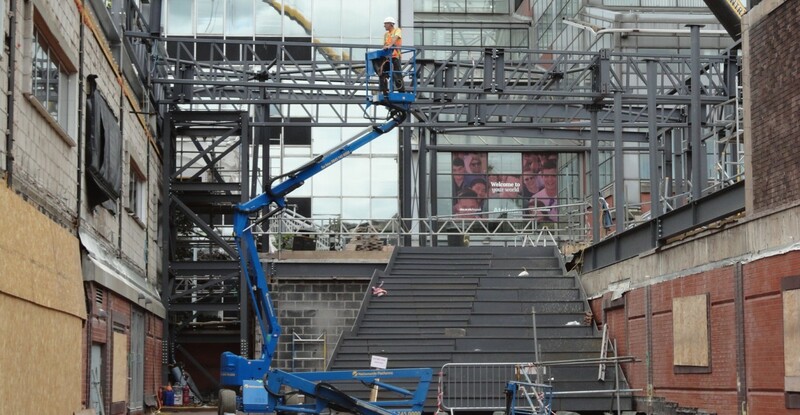 Work on site for Sheffield Hallam University’s (SHU) new STEM (Science, Technology, Engineering and Maths) facility reaches a key phase of construction, as the steel work for the atrium starts to come together. Located within SHU’s city campus, the atrium of the STEM development will form a gateway entrance to the university and provide a key route through the city to all, especially those arriving at the nearby station. It will provide the department with over 600 sqm extra indoor, multifunctional floor space, including; student breakout areas, exhibition areas, helpdesk and café. As well as the construction of a new atrium, the associated contract works include extensive refurbishment of the existing Sheaf and Eric Mensforth Buildings. Works began on site in September 2015 and the scheme is due for completion in the spring, 2017. To see visuals of the proposed finished extension click here to visit the project page.